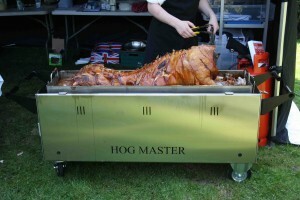 Graduation With A Hog Roast Bargeddie! The Spitting Pig catered a graduation party just last week with a hog roast in Bargeddie, where the guests enjoyed our ‘pig in a bun’ menu to celebrate Nicola achieving her business management degree at Glasgow University. Nicola’s parents organised the party a while back after calling us to ask about our different menus and catering options. They wanted the party at their local golf club but needed to check if it was allowed first; otherwise, it would be held in their large back garden. Either would work for us, so we pencilled them in and awaited confirmation. When we heard back, it turned out that the golf club was already fully booked over the summer months, so we would be roasting the hog roast in Bargeddie in their garden. We arrived at the lovely countryside home nice and early on the morning of the party, for an early lunch serving. This party was for close family and friends; in the evening, Nicola and her friends would be taking the party to the city, to bars and nightclubs, so they needed to be properly fed in advance! We set up our marquee and serving tables and started up the hog roast machine. Nicola’s parents watched, fascinated, as we prepared the pig for cooking by scoring it all over in diagonal shapes, adding water and then covering it with lots of salt. Nicola’s Dad said he’d never realised just how easy it was to prepare and cook a whole pig and decided that he would hire one of our machines himself, so he could DIY a hog roast in their garden sometime during the summer. As the pig cooked slowly but surely, a team of party planners decorated the garden and house beautifully and then eventually Nicola and the guests started to arrive. We let the hog roast in Bargeddie rest for half an hour before carving out the lovely, golden crackling and then sliced into the meat, filling fresh bread rolls with both. We also brought along lots of our special sage and onion stuffing, delicious apple sauce and plenty of different condiments. Nicola was first in line and said it was so incredibly tasty that she wished she could graduate again tomorrow!